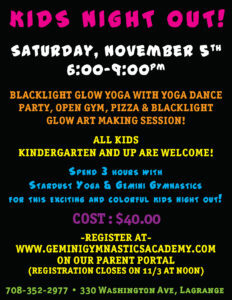 Join us for blacklight glow yoga with yoga dance party, open gym, pizza & blacklight glow art making session! All kids kindergarten and up are welcome! Register on our parent portal! Registration closes on 11/3 at noon for this event.